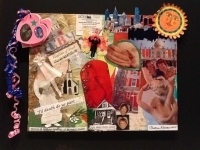 The first day of camp I was thrilled to learn “Narrative Collage” had been added to the program, taught by Maddy Gold, who has extensive experience teaching art in several Philadelphia colleges. It is probably “no accident” that I gravitated to Maddy’s class. My Saybrook dissertation on Creativity and Aging (Robertson, 2005) studied the impact of creativity on the lives of older adults. Part of my work examined the developmental life tasks of older adults. Thirteen theorists I studied agreed that the last period of adult development requires a “summing up” of what life has been to this point so that one can move on to a period that includes generativity and transcendence. What better way to review and look at the most meaningful parts of one’s life than through a collage! Maddy suggested one could create a collage using a triptych—the art form using three panels put together to represent different periods. I decided to present the three periods of my adult life in my collage. Part of any life review requires facing the ups and downs or the peaks and valleys of one’s life. While the “peaks” of life are always fun to remember, it is the “valleys” that are more problematic. They can really bring you down! I struggled with how I wanted to portray a deep valley in the beginning of my adult life, which included the death of twins shortly after they were born, and the subsequent demise of my marriage. It occurred to me that reviewing this painful period through creating a collage might be helpful and healing. I remembered a powerful seminar I took with Natalie Rogers at a Saybrook Residential Conference where we created art to express ourselves and heal. As Rogers states in her book, The Creative Connection—Expressive Arts as Healing, not only do pictures speak back to the person who is creating it, “but the process of creating often transforms the feeling” (Rogers, p. 116). The first part of my collage—the part that presented a painful period of my life—took the longest to complete. I wanted to portray that I married young, with high hopes for marriage, but at the time had no idea who I was—let alone the person I was marrying! I created a cut-out figure of a bride, and Maddy, our instructor, made the excellent suggestion that I present it as a paper doll. This symbolized that at age 20, I was “playing the role of a wife” rather than knowing who I was and what I wanted for my future—note the doll has no face! I wondered how to portray the death of twins and decided to put a drawing from a comic strip saying “Baby Blues” in the upper left hand corner along with a certificate of death listing their names—Susannah and Scott. The “’til death do us part” was an ironic statement because it was the death of twins that contributed to my ex-husband and my “parting”—rather than the death of the bride or groom meant by the traditional marriage vows. Divorce & Decision Making—A Woman’s Guide (Robertson, 1980) refers to self-help books I wrote for women in the process divorce (another creative experience that helped me transform a difficult time). The rest of the collage “flowed”—I was able to portray the 15 years I lived in Chicago as a single mother and the 28 years I have lived in Philadelphia quite easily. While there have been “ups and downs” in my life in those periods, it is interesting to compare how vibrant the second and third sections of my “triptych” are compared with the first. I included scenes from places I have visited with John, my husband, whom I dearly love, by including his photographs. I also cut out a photo of the Philadelphia skyline that extends over the top of the canvas and a copy of a sun I painted on a chair seat for my husband in the upper right-hand corner. Maddy was the perfect instructor for the class. In addition to having a terrific sense of humor (which research suggests is connected to creativity), she encouraged us to “move beyond the boundaries” rather than “stay within the lines”—as I was admonished to do in elementary school. She inspired us to experiment with different colors, mediums, and materials. For me, doing the unexpected, experimenting, and moving beyond the boundaries symbolizes the positive aspects of the later years. As I completed my collage, I wondered where to add pictures of my six adorable grandchildren I also dearly love—Lauren, Ryan, Will, Charlie, Hattie, and Mae. I decided to put sibling pairs in hearts in reverse chronological order and attach them to the upper left-hand corner of my collage (remembering Maddy’s encouragement to move beyond the boundaries). A photograph of my most recent grandchildren, two-year-old identical twins, Hattie and Mae, is on the reverse side of a heart showing a sonogram of twins with a cut out saying “birthday bonanza”—which they certainly were! The hearts with pictures of my grandchildren covers, in part, the “baby blues” sign that was prompted by the death of my twins that occurred more than 40 years ago. Somehow in creating my collage, I had managed to “come full circle.” As in the collage, my grandchildren are in the forefront of my life—they help to “cover” a sad event from my past—even though it will always be there. In her research with older people, Kaufman (1986) found an “ageless self maintains continuity through a symbolic, creative process …. Identity is not frozen in a static moment of the past” (pp. 1, 14). Older people “formulate and reformulate personal and cultural symbols of their past to create a meaningful, coherent sense of self, and in the process they create a viable present” (p. 14). For me, the process of reviewing my life using the vehicle of the narrative collage supports this research. I am grateful to Maddy Gold, Irene Sfakianos, and the Philadelphia Corporation for Aging for offering this opportunity. While it was helpful to have the instruction, materials, and setting provided, it is possible to create a narrative collage on your own. I highly recommend it! Kaufman, S. R. (1986). The ageless self. New York: New American Library. Robertson, C. (1980). Divorce & decision making—A woman’s guide. Chicago: Follett Publishing. Robertson, C. (1989). A woman’s guide to divorce and decision making. New York: Simon & Schuster. Robertson, C. (2005). Creativity and Aging: A grounded theory study of creative older individuals [Doctoral Dissertation]. Saybrook University, San Francisco, CA. Rogers, N. (1993). The creative connection—Expressive arts as healing. Palo Alto, CA: Science & Behavior Books.